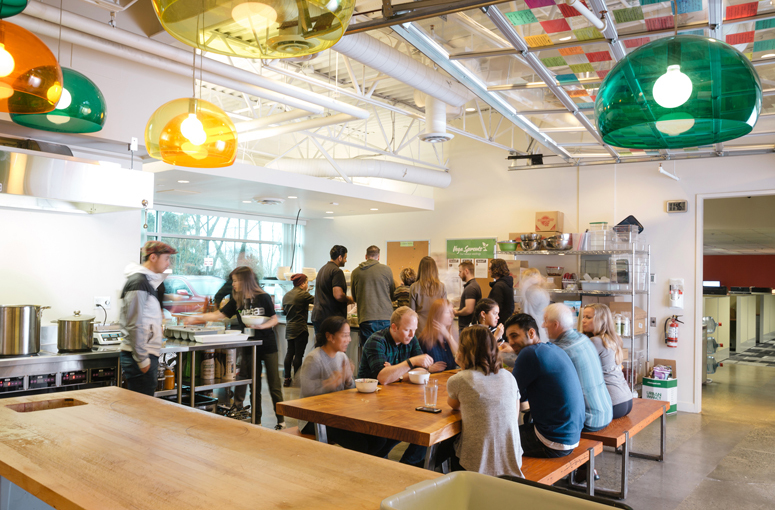 We’re passionate about plant-based nutrition, and if you visit Vega HQ in Burnaby, BC, Canada you’ll taste a delicious breakfast, lunch and snacks from our robust plant-based kitchen. Staffed by a professional chef, every day Vegatopians (Vega employees) enjoy a full smoothie bar, warm lunch and salad bar, as well as plenty of snacks to keep the hanger at bay. It’s one of the more delicious ways we foster a sustainable workplace for our people and our planet. Let’s take a quick tour and talk to our Chef Haley, shall we? Tell us about the Vega HQ lunch program! “The lunch program is so amazing. It’s an opportunity for Vegatopains to have nutritious plant-based food every single day. I think this takes a lot of the worry and stress out of their home life because they don’t have to worry about meal prep, grocery shopping for lunches, or how they’re going to fuel busy days at Vega HQ. It’s also an opportunity to perhaps explore a new style of cooking, eating and types of food. I think this is the most amazing perk that a workplace could give you—the nourishment to fuel your busy work day and to live your best life. What’s your favorite thing about being in charge of this program? “For me it’s really awesome because it’s really unheard of for a Chef to create whatever they want, whenever they want. I get to ask myself, ‘What do I want to eat this week?’ ‘What’s interesting?’ ‘What’s delicious?’ What’s nutritious’” I also love seeing my coworkers line up with excitement to eat, rather than dreading to open up a crushed sandwich from home. What are Vegatopians’ favorite meals? The first Vega Chef, food is the center of Chef Morgan’s universe. A mother and much-loved Aunt, getting kids in the kitchen is just one of Morgan’s passions. Find more of Morgan’s articles and plant-based recipes here. Lover of veggie puns, and often found gushing over vegetables at the farmer’s market, Chef Chantal is an expert at making delicious, nutritious, quick meals on a budget. Find more of Chantal’s plant-based recipes here. What is your go-to lunch meal?